Solid wood picture frames can be quite expensive, especially if they are large and if the wood is a good quality hardwood. Hardwood flooring remnants left over from a floor installation can make an attractive framing material. Some work has to be done to the boards before you turn them into picture frames, but once you have everything set up, it is easy to prepare a large number of boards for future picture frames. Make a simple picture frame from hardwood floor planks. 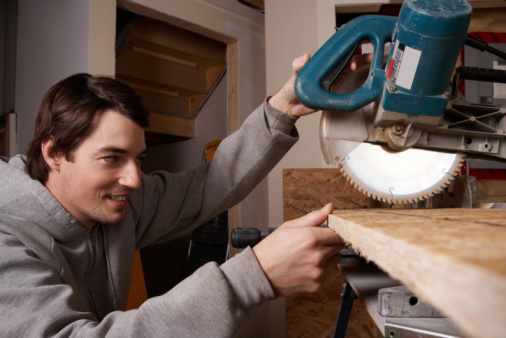 Position your hardwood floor plank on the table saw so that you can cut off the tongue. Cut off the tongues on all of the planks you want to turn into picture frames. Set your table saw to cut through half the thickness of the plank. Look at the end of the plank and mark the side depth of the groove. Set the saw to cut at the mark. This should create a rabbet on the bottom underside of the board all along the length of the board. A rabbet is a two-sided recess cut into the edge of the wood. Cut a rabbet along the bottom of the grooved side of each plank. Select four rabbeted planks that are close to the same length to make a square picture frame. Set your miter saw to 45 degrees. (The blade will be toward the back right side, the power handle will be toward the front left side.) Position your plank so that the rabbet edge is toward you and down. The rabbet edge is always the inside edge of the frame. The rabbet holds the glass, art and support board in position. Slide the plank to the left and trim off the right edge. Repeat this on three more boards. Measure your shortest length of board. Measure from the sharp point you just cut. That point is the top or outer edge of the picture frame. Mark each of your boards the same measurement along the top, outer edge. Reset your miter saw to 45 degrees in the opposite direction. The blade will be toward the back left side, and the power handle will be toward the front right side. Position your plank so that the rabbet edge is toward you and down. Slide the plank to the right and line the blade up with the mark and trim off the left edge. Repeat this on three more boards. Lightly sand your miter cuts to remove any edges. Apply a bead of carpenter's glue along the miter cut of two of the boards you have cut. Attach a picture frame clamp to hold the corner together. Position an L bracket crossing the corner and mark the screw holes. Drill pilot holes at the screw holes and screw 1/4-inch screws holding the L bracket in place. Repeat for all four corners.